KIEV, Ukraine -- Ukraine’s defense minister said he’s confident victory over pro-Russian separatists is close, as fighting disrupted an international team searching the wreckage of the Malaysian airliner downed over the rebel-held east. “Our forces are in an offensive phase,” the minister, Valeriy Heletey, said in an interview with the BBC broadcast late on Aug. 3. The army took control of Yasynuvata, about 20 kilometers (12 miles) from central Donetsk, cutting the access for rebels to roads from the north, military spokesman Andriy Lysenko told a briefing in Kiev yesterday. Five Ukrainian soldiers died and 14 were wounded in the past 24 hours, he said. Ukraine’s offensive may give Russia “an excuse” to invade its neighbor, Mykhailo Koval, deputy head of Ukraine’s National Defense and Security Council, said yesterday. With 33,000 troops near Ukraine’s borders, including 23,000 in Crimea, as well as 160 tanks, Russian forces are showing signs of preparation for “active military actions,” he said. Ukraine’s armed forces are pressing ahead with their offensive after the U.S. and the European Union increased pressure on Russian President Vladimir Putin over his backing for the rebels with an expansion of sanctions. The downing of Malaysian Air Flight MH17 on July 17, which the U.S. says was probably caused by a missile fired by the insurgents, has helped harden attitudes against Russia. The rebels and Russia blame Ukrainian forces. A team of more than 100 international police and forensic experts returned to the crash site for a fourth day yesterday, continuing the search for remains of the 298 victims -- two-thirds of them Dutch -- who died on the Boeing 777 flying from Amsterdam to Kuala Lumpur. The team found more human remains on the first two days of their search to add to those already transported back to the Netherlands in 227 coffins. As Malaysian investigators joined the Australian and Dutch experts for the first time, the search was halted for several hours because of shooting heard in the area, Pieter-Jaap Aalbersberg, the head of the mission, said in an e-mailed statement yesterday. Once work resumed, they recovered personal belongings. “The international police officers and experts were confronted with arduous circumstances today,” Aalbersberg said. Russia’s benchmark Micex stock index rose 0.3 percent yesterday. Ukrainian government bonds fell to a six-week low, with the yield on the dollar note due July 2017 increasing four basis points to 9.36 percent in Kiev. The separatist forces, which now number about 15,000, up from 300 when the conflict started, hold less than half the territory they did four weeks ago, Heletey said. More than 65 towns and villages in the Donetsk and Luhansk regions of eastern Ukraine have been retaken, he said. The situation in Donetsk was “very tense” overnight with heavy artillery fire heard, the city council said on its website yesterday. There are power cuts in many areas of the city, it said. Ukraine’s army deployed rocket launchers near the regional center of 1 million and Grad systems have killed 40 people in the city of Horlivka, Russia’s Foreign Ministry said on its website. The ministry’s accusations are “groundless” and Ukraine’s military operation is “strictly” following the aims defined by President Petro Poroshenko, the security council and parliament, Oleksiy Dmytrashkovskyi, a spokesman for the Defense Ministry in Kiev, said by phone. Russia’s state-run RIA Novosti news service cited border guards as saying a group of 438 Ukrainian servicemen had crossed the frontier and asked for asylum. 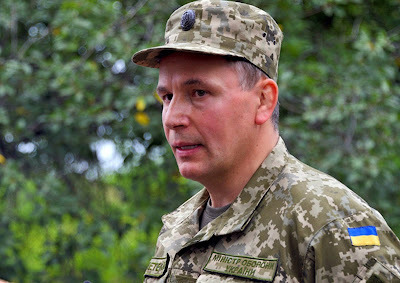 The troops, who were fighting near the border, had “no other option” but to cross over after they were shelled from Russian territory, Dmytrashkovskyi said. Of the Ukrainian troops, who arrived in Russia after running out of weapons and ammunition, 195 asked to return home, Vasily Mayaev, a spokesman for the FSB security service, told reporters yesterday in Rostov, Russia. The remaining soldiers may apply for Russian citizenship at their own discretion, he said. The fighting has claimed more than 1,000 lives so far. While Russia has repeatedly denied any involvement in the conflict, the U.S. and its EU allies blame Putin for failing to rein in the insurgency and stop the war. Russia is ready for “any format” of talks with the EU, the U.S. and Ukraine, Russian Foreign Minister Sergei Lavrov said yesterday in an interview with the Itar-Tass news service, posted on his ministry’s website. Representatives of Ukraine’s southeastern regions must be allowed to send representatives to the negotiations, he said.